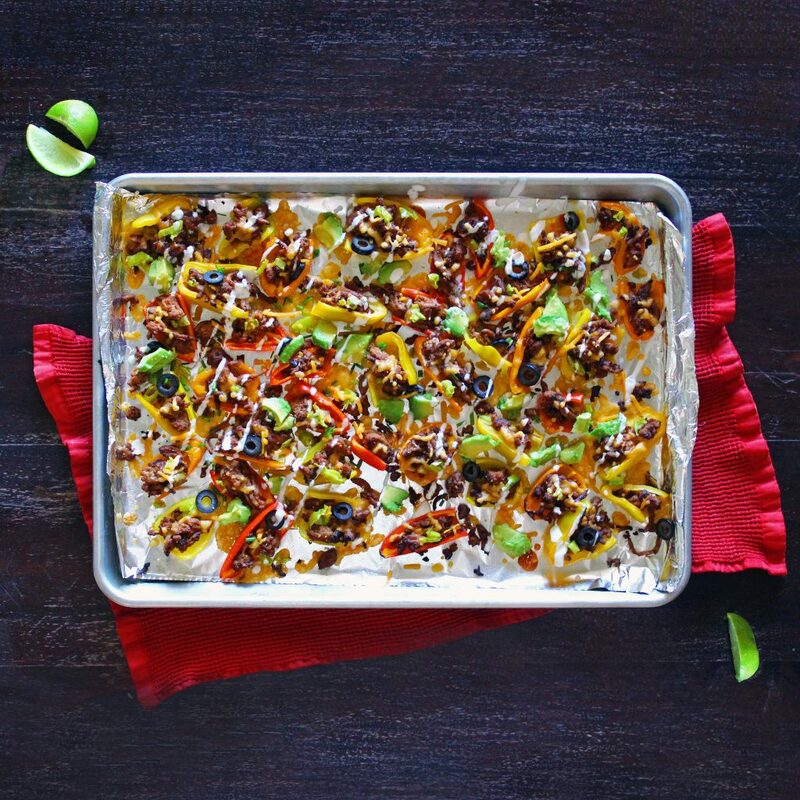 Home » Recipes » Bell Pepper Nachos: a Healthy (and skinny) Nacho-Remix! These skinny, healthy Bell Pepper Nachos are filled with fresh veggies and lean ground turkey. A quick sprinkle of cheddar cheese on top makes these nachos taste indulgent, without detracting from the health benefits of this clean-eating, guilt-free nacho recipe! These mini-bell pepper nachos are a clean-eating, healthy meal that can be made and enjoyed any time of year. But if I had to play favorites, there is something so special about bright, fresh summer produce dancing around these nachos. You can literally taste the vitamins bursting out from these peak-season veggies and straight into your soul. Dramatic enough description? Hope so. Plus, let’s face it. Summer is the season of Bikinis, Beach Bodies, and… Bell Peppers. Yes it’s true, that is the literal definition of “summer”, which can be found in any respectable dictionary. Look it up, it’s definitely in there. So why not combine all 3 of these summer quintessentials into 1 awesome package- say, ohhh I dunno, slimming bell pepper nachos?! This recipe in particular will help you achieve a killer summer beach body, fit for any bikini! 6-pack abs, firm booty, shredded arms, and fitness magazine covers, here you come, all thanks entirely to these nachos! Ok… so there are a few other steps involved besides just eating ‘skinny nachos’, and morphing into a supermodel overnight. But this is a yummy step in the right direction ok, jeez just trying to help. Anyway, back to the recipe at hand! These mini bell pepper nachos have a little bit of kick to them (nothing crazy, just enough to spark that metabolism into gear), feel free to add or omit any spicy ingredients as you see fit! I love dousing them in hot sauce for a bit more fire, and that also helps counter the sweetness of the mini bells. I also go a bit heavy-handed when sprinkling the cheddar cheese, because frankly I love cheese more than I love myself. ADDITIONAL TOPPING IDEAS: Cooked shrimp, black or pinto beans, roasted corn, diced tomatoes, chives or green onions, cilantro, pico de gallo, tomatillo salsa, cooked brown rice, etc. You could also go the extra mile and whip up some guacamole using the diced avocado already listed in this recipe… use your imagination! 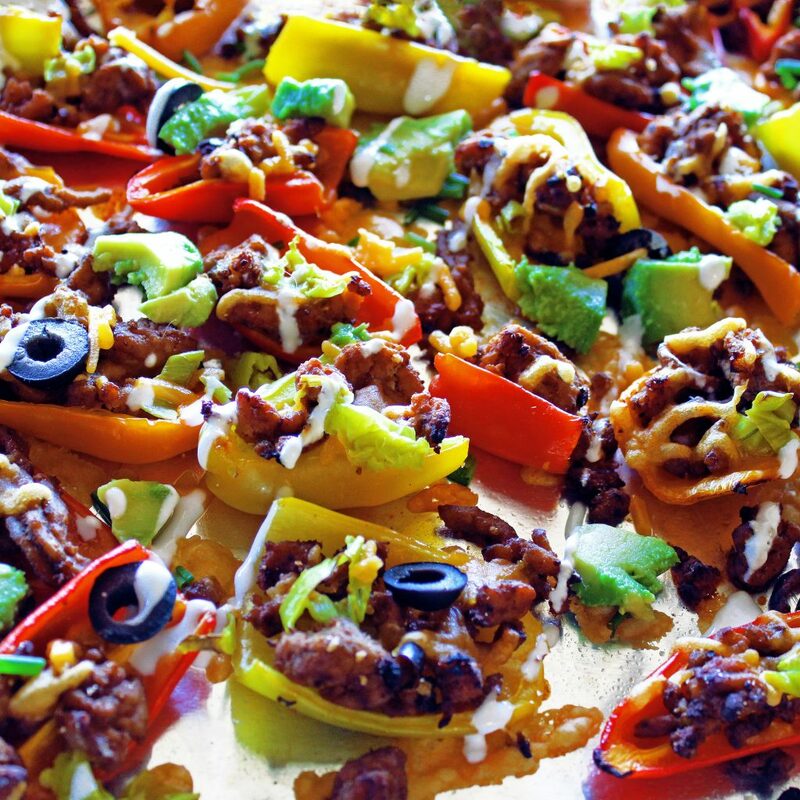 These skinny, healthy Bell Pepper Nachos are filled with fresh veggies and lean ground turkey. A sprinkle of cheddar cheese on top creates a sense of indulgence, without detracting from the health benefits of this clean-eating meal. Preheat oven to 400 degrees, or set your broiler to High. Heat the oil in a skillet over medium-high heat. Add onion and minced garlic, cook 30 seconds. Add lean ground turkey, tomato paste, diced green chiles, cumin, chili powder, and salt/pepper to taste; stirring to combine. Brown the turkey, using a wooden spoon to break up into smaller pieces, until cooked through (apprx 15-16 mins). Drain off any fat. Place sliced bell peppers on a baking sheet lined with foil. Take a handful of the ground turkey and start stuffing your bell pepper slices with a small amount each, making sure not to overload the peppers with too much meat (you want to leave room for the other toppings). Sprinkle, or stuff, the bell pepper nachos with remaining toppings: pepperoncini peppers, pickled jalapeno slices, black olive slices, and cheddar cheese. Bake bell pepper nachos at 400 degrees for 7 minutes, OR broil bell pepper nachos for 2-3 mins, until the cheese is bubbly and golden. 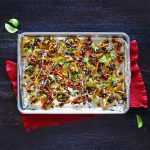 Top cooked bell pepper nachos with diced avocado, a dash of hot sauce, and a side of greek yogurt or light sour cream to help cool your palette! Squeeze lime wedges over nachos for a tangy hit of flavor, which will balance the sweetness of the mini-bell peppers. Dig in and enjoy! 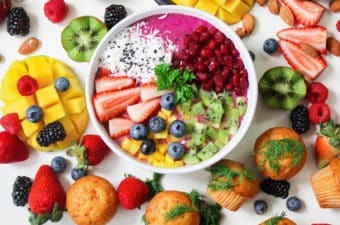 ADDITIONAL TOPPING IDEAS: Cooked shrimp, black or pinto beans, roasted corn, diced tomatoes, green onions, cilantro, pico de gallo, tomatillo salsa, cooked rice, or guacamole- just to name a few! NOTE: I ended up with a good amount of excess ground turkey, since I wanted to fit as many other toppings as I could on the nachos! So I used the leftover turkey for breakfast the next day, topped with a fried egg. 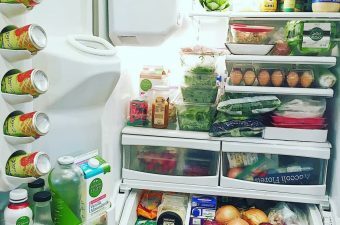 Any extra ground turkey that you end up with can keep in the fridge for 3-4 days. What other variations do you guys enjoy to turn normal nachos into healthy nachos?! We are all ears! Please leave us a comment and let us know if you end up trying this bell pepper nacho recipe, and also what you think! We love interacting with our readers! Ooooh I can’t wait to try this! Definitely seems like the perfect summer meal, especially with fresh summer produce as you mention. Yum! !